This is a common effect with procedural generation, As far as I know every software has it, more or less pronounced. your computer is calculating a massive number of graphical elements in real time, when you are exploring surfaces of procedurally generated objects. These elements are recalculated while you're moving towards them, by multiplicating the number of components, in order to have a better final shape. All of this using the RAM and GPU of your graphic card, which could be the problem. If you provide your se.log as described above we could see how much RAM can be used by SE. After that, I believe it's only a matter of searching the best settings for your machine. I've noticed about 99.9% of all stars I visit and come close to, they all look like globs of molten metal - there's no actual surface of the star so to speak (with no sun spots, flames, etc). I've taken two screen shots - one of Betelgeuse up close and one of it from it' orbiting planet Betelgeuse 3 (I've disabled "actual lighting" for sun/planet to easily show what I'm referring to. There are some stars (white dwarfs, for example) that are simply untextured white circles that are simply bright but just plain white circles (I can take screenshots of this later if required, I'm just strapped for time right now). Betelgeuse is a giant star which doesn't look like normal stars (this is realistic). Go to Sol if you want to see a normal star. As for being untextured, I think you're confused by their overexposure. Low the exposure value if you want to see the surfaces of stars. Thank you for the clarification! It helped clear up my misunderstanding! I have one other (minor) issue. In the screenshot below, periodically I'll see a sort of "texture tearing" in space (it happens with some planets too) where it looks like the "edge of the texture" is cut/pasted next to another texture, leaving a long line through the image. I find it doesn't disappear by changing angles (for reference, that's the black hole at the center of the Andromeda galaxy) just to the right of center). Is it just how the texturing is or is there perhaps a setting I'm missing? That's a seam in the skybox, you should only ever see it near the center of a galaxy. If I'm not mistaken that issue was fixed, you should update to at least 0.9.7.3.
taylordonovan11, terrain doesn't look spectacular everywhere you go. Like in real life, some places have amazing terrain, some places have boring terrain. The one place you showed screenshots of just happens to have boring terrain. You should explore more. Also, your computer specs make a big difference regarding the level of detail you can generate terrain at. As mentioned in the opening post, you should attach your log file so we can have more information to help you. Ah, I see! Good idea, will have to try that! I have a new question. 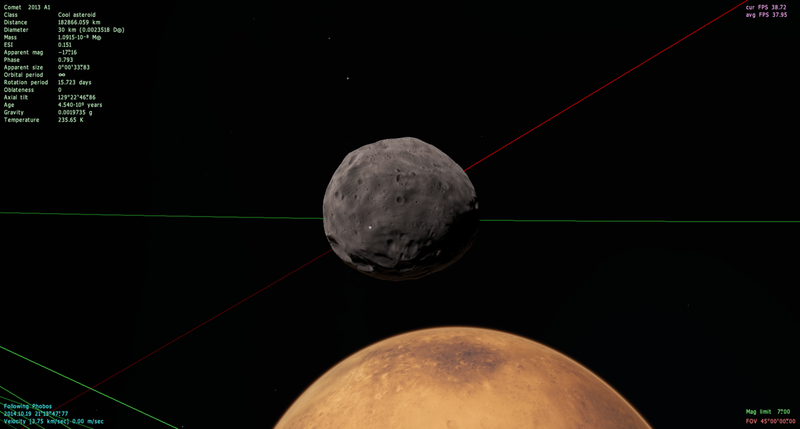 I am running version 9.7.4 build 8, and when I find a planet with more than one moon, but most of them are asteroids, the system viewer will only show satellites that are big enough and round enough to classify as moons. Is there a setting to change this and show all satellites? Thanks! Is there a setting to change this and show all satellites? Press the system browser settings icon, then check dwarf moons. Hey there, I downloaded Patch 8 on version 0.9.7.4 and it was fine until I went out of the Milky Way, everything disappears, it also crashed when I left the Milky Way for the first time on Patch 8. When I try to reload the game everything is still gone, not even the side menu's will work. Just a plain black screen, I have the latest drivers. if you have a file with the name 'atioglxx.dll' in the system folder of 'SpaceEngine', delete it. Otherwise post the 'se.log'. You will also find this file in the 'SpaceEngine' system directory. I don't know if this is the correct thread, I'm trying to made a video of Space Engine but i'm having trouble in the configuration of the codec. In all the video codecs I try to use, the result video is poor. The only way i find to the video looks good is the Uncompressed frames, but the final video archive have problems with the frames index and only VLC player can barely reproduce them. Well... what is the best codec and it's configuration to a good quality final video? If you want a good result, you'll need to install a codec from the internet. Lagarith is a good codec for lossless video, but it results in large file sizes, so you'll need a lot of hard drive space if you want to make long videos. The DivX codec is good for producing good quality video at small file sizes, but it's extremely difficult to find the DivX codec pack these days. Also, there are threads which talk specifically about making videos in SE, this would be the best place to discuss this. I got space engine and for some reason, every object (stars, planets, asteroids) are invisible. I am a computer idiot and can't figure out how to put the image in a post, so it is just an attachment. As you can see, the Earth is nothing but an aurora. The sun is a splotch. I updated from 0.9.2 to 0.9.3, but it didn't fix anything.